Pick & Choose which houses you would like included Most properties require 1-1½ hours to tour. 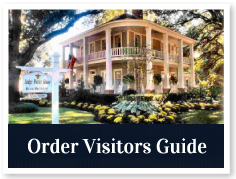 All of the homes offer group tour rates. (800) 984-1080. By appointment only. Circa 1850s. This massive Greek Revival home was originally located in Mansfield, Louisiana. It was moved to its current location in 2003. Includes tour of the American Cemetery. (888) 346-4095. Built in 1840 this historic home was the site for much of the filming of the movie Steel Magnolias. Recently restored and furnished with antiques from around the world. (318) 352-6723, by appointment. Circa 1790. 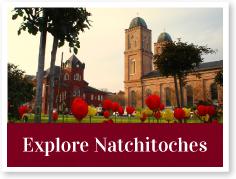 This unique property is owned and operated by the Service League of Natchitoches. A 2½-story bousillage Creole structure that was renovated to the Federal and Greek revival styles of the 1820s. The largest bousillage structure in the United States, it features original hand-hewn pegged cypress beams, and a 3-story staircase. The house was restored with a Save America's Treasures grant.